Democrat (Term Expires: 2020) serving Allegheny (part) County. mem. 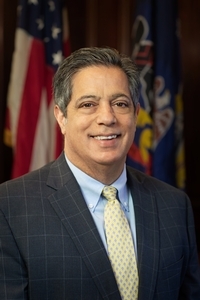 Pennsylvania and Allegheny County Bar Associations; admitted to practice, U.S. Supreme Court, Western District of Pennsylvania; Shareholder, Principal, Dickie, McCamey & Chilcote P.C., Pittsburgh; University of Pittsburgh Board of Trustees; Board Member, Pittsburgh Catholic Charities Health Center; Board Member, Treasurer, Community College of Allegheny County; Board Member, Pittsburgh Ballet; Board Member, Forest Hills Community Development Corporation; Board Member, Columbus Day Parade Committee; Board Member, Italian American Sports Hall of Fame; Board Member, Mon Valley Initiative Community Investment Fund; Board Member, Duquesne University Alumni Association; Board Member, Duquesne University Law Alumni Association; Board Member, Pittsburgh CLO; Board Member, Senator John Heinz Pittsburgh Regional History Center; Board Member, Three Rivers Wet Weather; Life Board Member, Carnegie Library of Pittsburgh; Allegheny County Register of Wills, Jan. 1992 to May 1996; Member of Senate May 13, 1996 to date; Minority Caucus Chairman 2005-2008; Minority Appropriations Committee Chair 2009-2010; elected Minority Leader 2011.